Cassette Nine, 9 Vulcan Lane, Auckland CBD. Door open 7.30pm. Show starts 8.30pm. Tickets: $10.00 + BF via Eventfinda or $15.00 on the door. Be afraid, be very afraid… from the psychos who brought you the sold out Rocky Horror Halloween in 2015, as well as sell out burlesque shows such as Classique/Erotique and Tomfoolery, we invite you to a hauntingly good night of entertainment as Va-Va-Voom Productions takes over Cassette Nine and transforms it into your cult horror fantasy nightmare. Whatever you do,don’t fall asleep, and don’t look under the bed. Watch the creatures of the night as a selection of New Zealand’s hauntingly thrilling entertainers perform their own adaptations of your favourite cult horror movies. 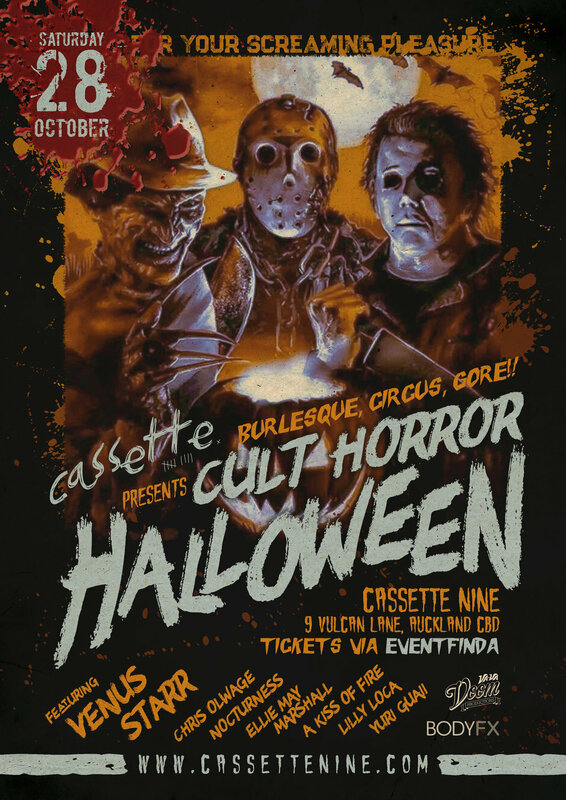 Expect the unexpected as burlesque, circus, fire and dance acts, as well as thrilling DJ’s, take over Cassette Nine and send you into a hypnotic trance. Come play with us, forever and ever and ever. - Venus Starr (Headliner) - Internationally Acclaimed Burlesque Showgirl. - Christopher Olwage Official - The Black Swan of Burlesque. - Ellie May Marshall - Circus Artist - Circus Contortionist. - Nocturness - Dark Mistress of the Night. - A Kiss of Fire (Pandora Cherie & Ivan the Red) - Fire, Adagio, Burlesque. - Drew Blood - Drag Performing Artiste. - Lilly Loca - MC & Consummate Mistress of Disguise. We know the suspense is killing you...tickets will be on sale from September 13th on Eventfinda.co.nz. As per request, we will be pre-selling tickets so you don't miss out on the door. GA tickets will be $10.00 via Eventfinda and $15.00 on the door. Door tickets will be strictly limited. Our last Halloween event sold out on the door before the show commenced, so be sure to book quickly before they sell out. We have such sights to show you. Beware! Performer details will creep up on you over the next few months to ensure you’re thoroughly petrified before snatching up your tickets. Dress-up is encouraged. Prizes sponsored by BodyFX.